This fun mountain bike route starts at Patterdale YHA. It's about 9 miles long and circles Birk, Sleet and Place Fells along the edge of Ullswater and back through Boredale. 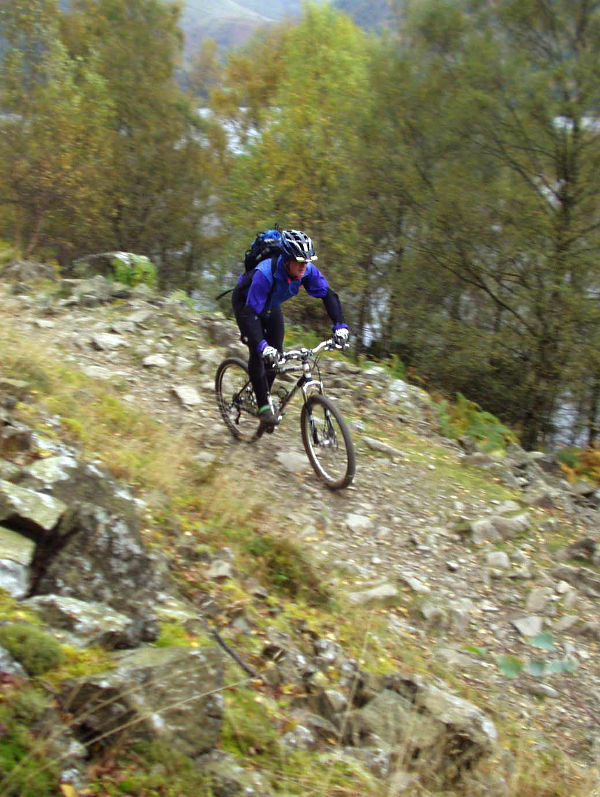 The trail by Ullswater undulates along the side of the lake with quite a few technical sections and a little bit of carrying in places. 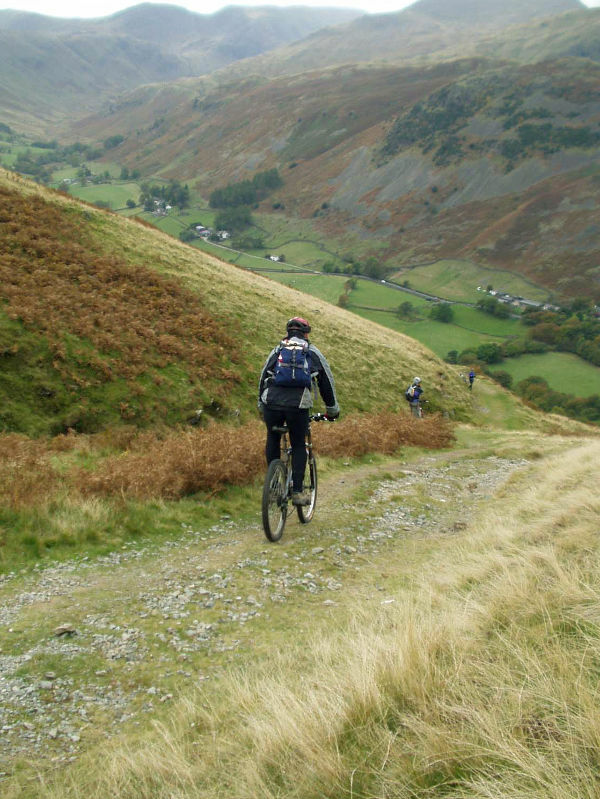 There is one significant climb out of Boredale but even this is rideable until the last short section and the carry to the top. 1. Turn right out of the YHA car park (GR398157) onto the A592 towards Grisedale. After 1/3mile turn right on the wide track at the end of a row of buildings on the right, which are set back from the road slightly (GR394161). Cross the bridge then on the other side of the valley climb gently though a couple of bends before dismounting for the farmyard and cafe. 2. Go through the yard and turn left onto the BW (GR398163). 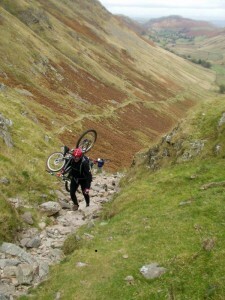 For the next few miles it is simply a case of following the main trail while keeping Ullswater on the left. At the start don't take either of the two tracks off to the left. 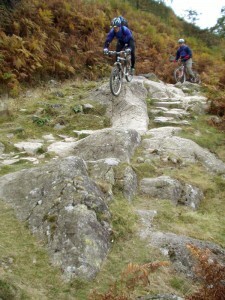 The technical riding starts as the trail drops right through a tight, steep rock section. 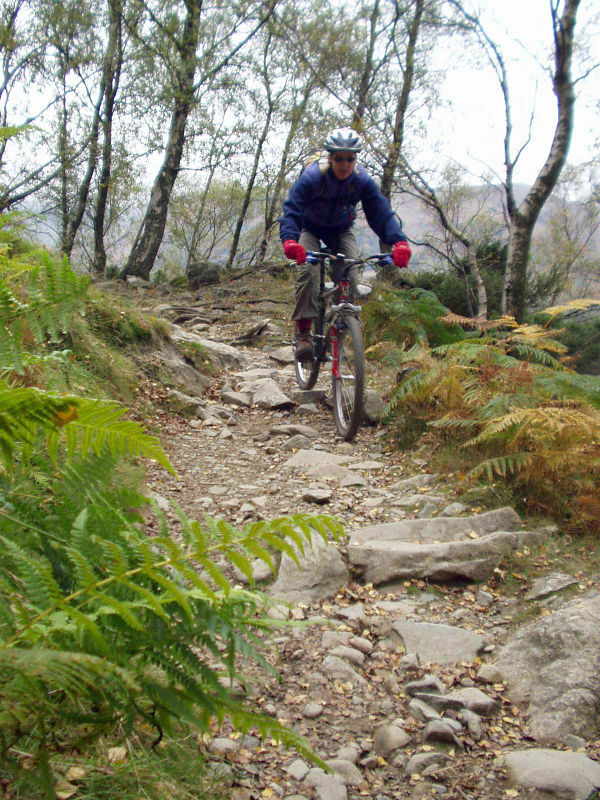 What follows is a series of short climbs and descents of various technical difficulty, the hardest of which will test good riders, especially when it's wet. There is one definite carry up some steep steps and, depending on your ability, a number of other short sections you may have to push or carry up. Keep your eyes out for walkers here as there is a ferry trip with a drop off at the far end of the trail. As the trail is made of lots of little sections they won't upset your enjoyment. I find that most stand back and encouraged stupidity anyway. 3. At the end of the trail turn right onto the tarmac road (GR424195). Follow the road and turn right at the next two junctions, for an easy spin up to the bottom of the only real climb on the ride (GR419170). 4. The tarmac finishes at two gates. Go through the gates and follow the trail as it climbs up the right hand side of the valley. 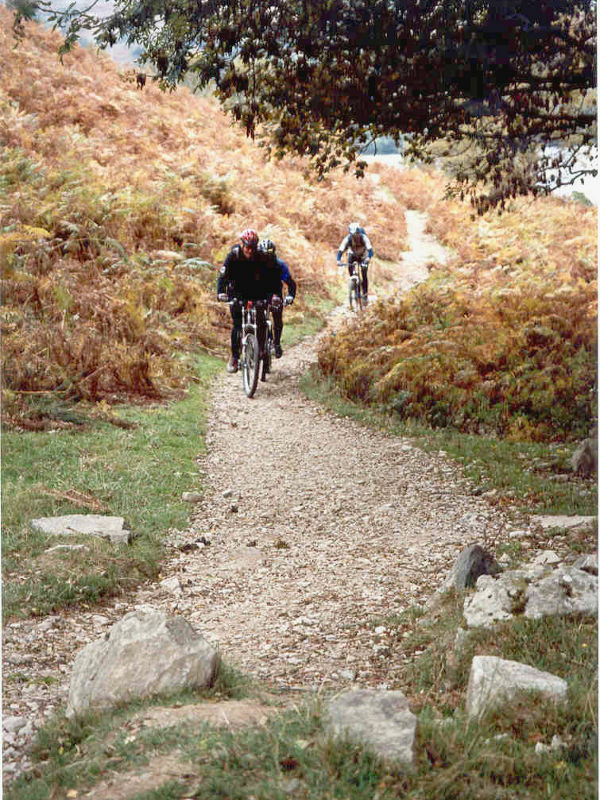 The trail is climbable but it’s a grassy drag that gradually gets steeper until the last 60 meters or so where hike'a'biking skills are required. Follow the trail up to a small plateau (GR409158). 5. Go straight on over the plateau then immediately drop into the gully in the 10/11o'clock direction, which can been seen dropping into the valley. After a short, steep descent the track comes out to a gravely little plateau. This is followed directly by a split in the trail (GR407158). Take the BW on the left the drops steeply to a stream crossing. 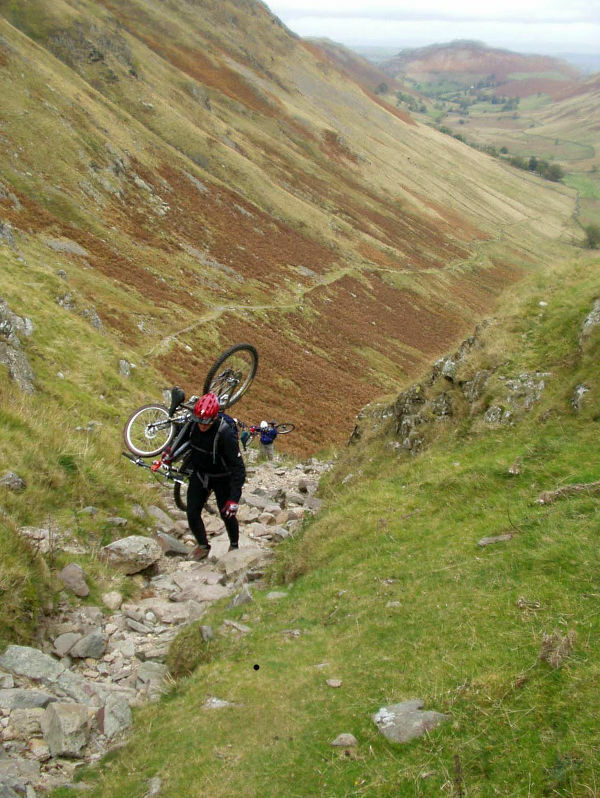 After the stream try to control your speed on the loose track that plummets to the valley floor. 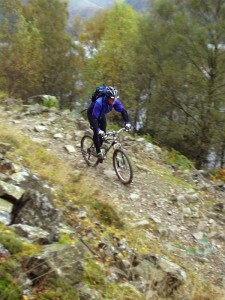 Be warned, it would be far too easy to gain too much speed and loose control. 6. At the junction at the bottom of the descent (GR405147) turn right and follow the track to the next junction a short distance later, with a gate straight on. Turn sharp left before the gate then go over the bridge and follow the track to a junction with the A592 (GR405147). Turn right and follow the road back to the YHA.